Summer vacation brings a steady stream of kids through my kitchen, frequently in search of snacks. 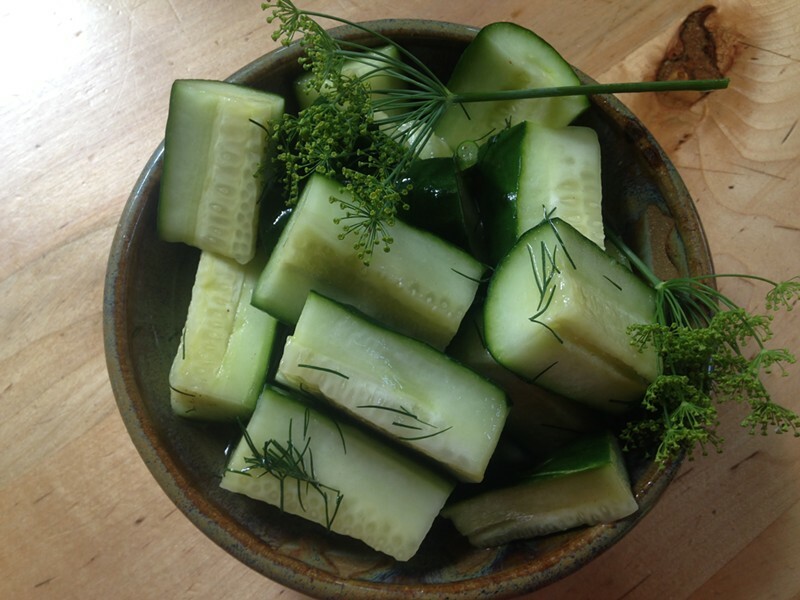 Quick pickles are a simple, crowd-pleasing solution, with ingredients that come right from my garden. This recipe satisfies two requirements: they're simple to prepare and super healthy. While I would caution to carefully follow any recipe that calls for preserving or canning fruits or vegetables, these pickles are made (and eaten) fresh, so this is a fairly relaxed process with ample opportunity to experiment. To mix things up a little, I sometimes add fresh green beans or thinly sliced beets to the mix. For my next batch, I’m tossing in cauliflower. Pickles are a perfect and snappy addition to macaroni and cheese, sandwiches or simply straight from the bowl. In a large bowl, dissolve the salt in boiling water, then stir in a half-dozen ice cubes to cool the liquid. Add all the remaining ingredients. Add more cold water to the bowl — enough to cover the cucumbers — and place a plate slightly smaller than the diameter of the bowl on the vegetables. I fill a mason jar with water and use that as a weight to press the plate firmly over the cucumber mixture. Leave the bowl at room temperature. The cucumbers will begin fermenting in the brine. After four hours, sample a spear. Depending on your family’s taste, either refrigerate to slow the pickling process, or leave at room temperature for a few more hours to pickle further. Store refrigerated in the brine, in a covered glass container, and eat within a week – if they last that long!